We are awake and out of bed just after 7.00am. We have to slap on lots of sunscreen as were told the temperature could well be approaching 100°F today in Darwin. 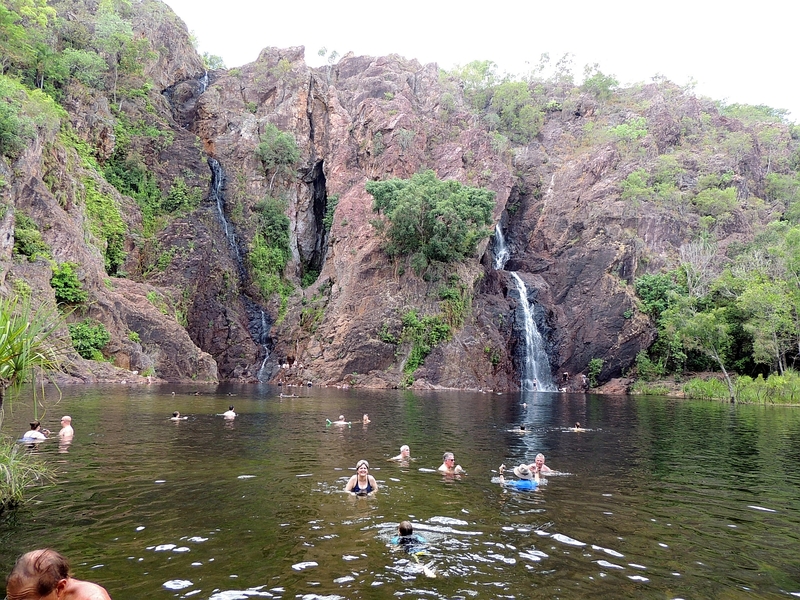 We are going on a tour into the Litchfield National Park that has been organised by a lady called Linda. Its going to be quite a long day as we are leaving as soon as we can after the ship docks at 8.00am and we are not due back until 6.00pm. The ship departs Darwin at 8.00pm. We go to Café Al Bacio and have a healthy breakfast of coffee, cheese Danish and sticky bun. We meet up with Linda and the rest of our tour group and disembark at 8.30am. Barney from Offroad Dreaming is waiting for us with his mini-bus and we are soon on our way. There are no Kangaroos in this part of Australia, only Wallabies and Wallaroos (a cross between a kangaroo and a wallaby). To encourage tourism in the off season in Darwin they have tagged and released 100 Barrimundi fish. Whoever catches one gets $10,000 (AUS). One fish is tagged and worth $1,000,000 (AUS) when caught. 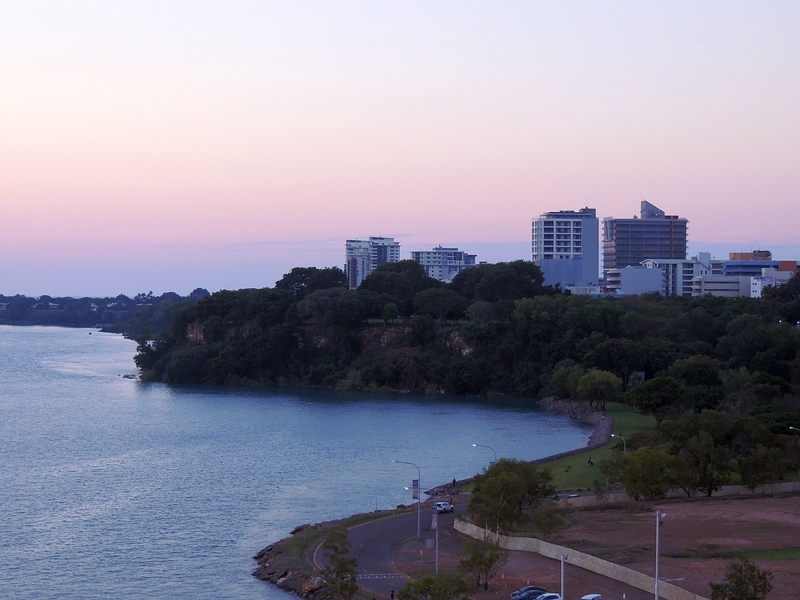 Darwin was heavily bombed by the Japanese in the second world war and there are more sunken ships in Darwin harbour than in Pearl Harbour. There is a small town nearby called Humpty Doo. A few years ago there was a cow that would walk into the same bar every week and was given a stubby to drink (a stubby is a bottle of beer). It eventually died of liver failure. There are feral wild boar in the area and licences are issued to legally hunt them. This is called pigging  not to be confused with dogging. Barny did not tell us the last part. One of the birds of prey to be found in the area is the Whistling Kite. When there are bush fires the kites hover above the smoke and feast on the small, fleeing rodents. In times of hunger the kites have been known to swoop down and pick up a burning ember and fly off to start a new fire elsewhere. Clever little buggers. He tells us loads more than this, but youll have to take a tour with him to discover the rest. 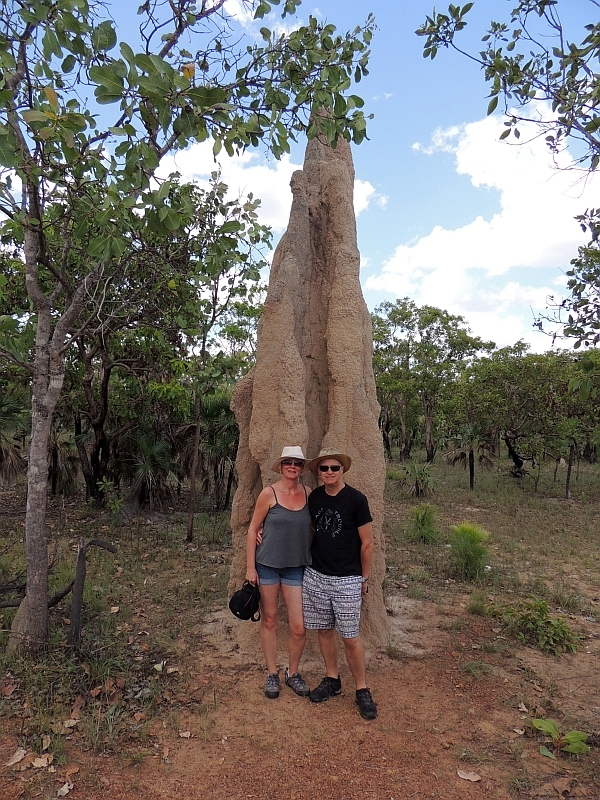 After a brief bathroom break we continue on into the park where we stop to look at two different types of termite mounds. Cathedral termite mounds are so called because they look like stone cathedrals. They grow 1 metre every 10 years and some are 5 metres high. 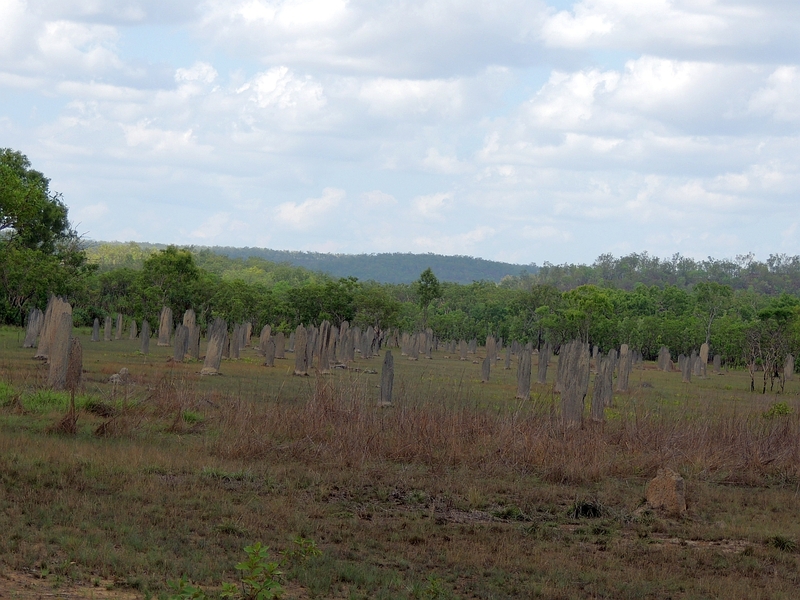 Magnetic termite mounds look like a field of gravestones as they are perfectly flat on the front and back and get their name from the fact that they always face north to south. 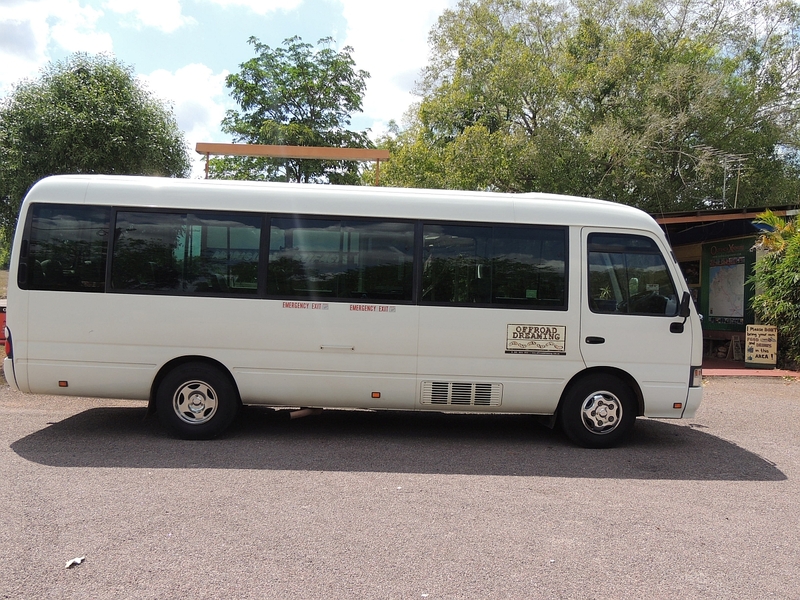 Our first main stop is at Wangi Falls. 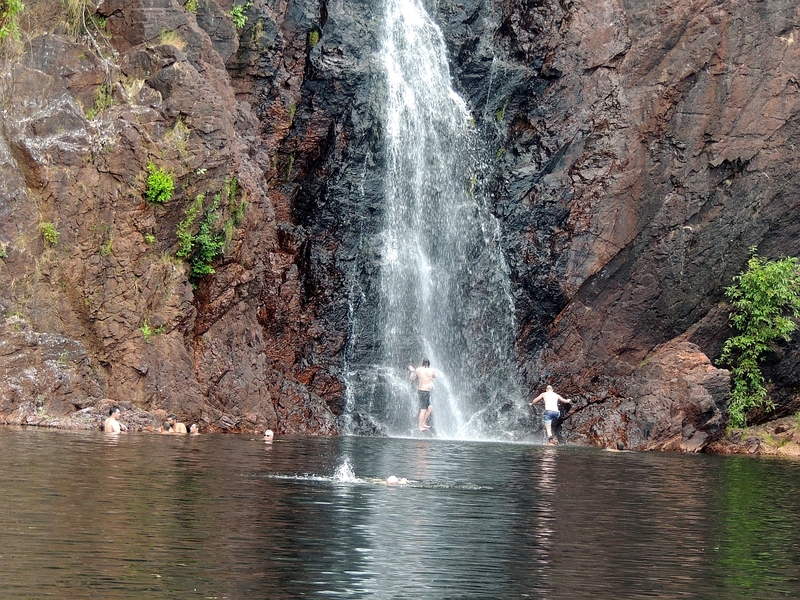 This has two waterfalls cascading into a small lake that you can swim in. 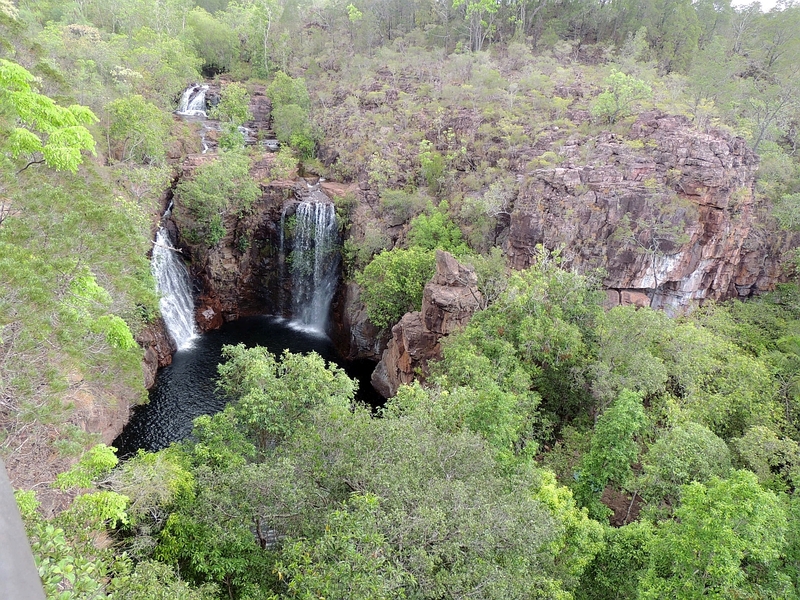 An aboriginal lady, Tess, walks us down to the falls and tells us about them. 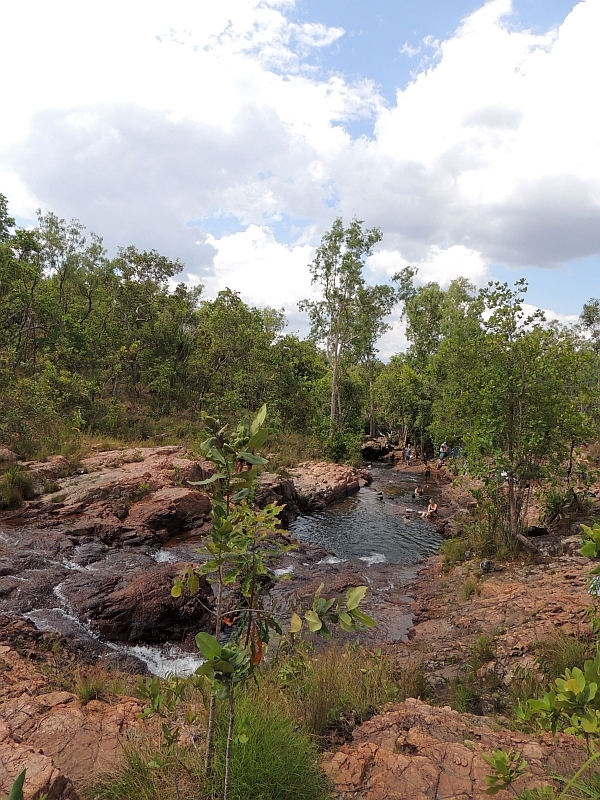 She says that the place is sacred to the aborigines and clambering onto the rocks is considered disrespectful, but they can do nothing to stop it. 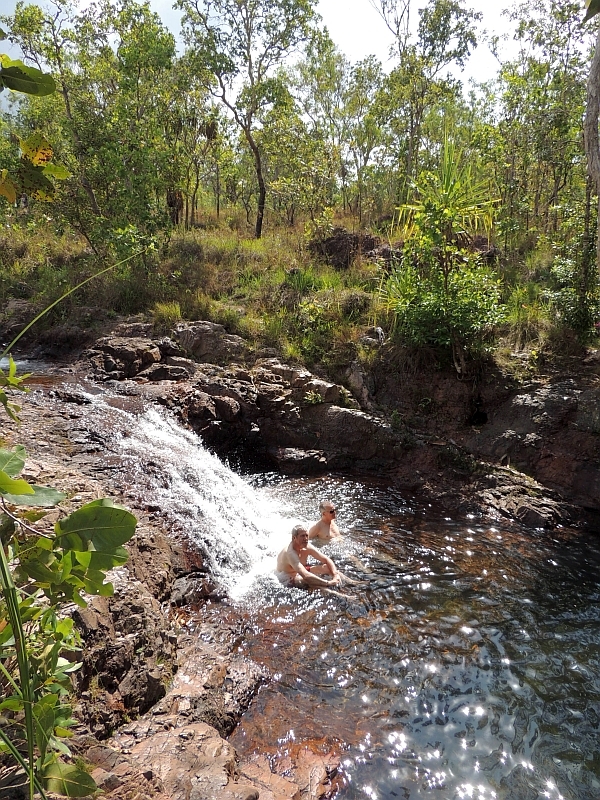 A few of our tour group, including me and Tam, go for a swim and its surprising how warm the water is. I swim across to one of the falls and try to take some video with our little action camera  lord knows how it will turn out. After half an hour we return to the car park where lunch has been laid out for us. Its a buffet of chicken with various salad items. The avocado is the softest and tastiest Ive ever had. Once weve had our fill everything is packed away. There is a large gas BBQ that is free to use just off to the side of us and 4 Australian lads arrive with a huge cool box full of food and drink. They start to barbecue onions, steak, chicken and all sorts of other goodies, filling the large BBQ grill. It looks and smells amazing. We walk by them on the way to the bus and Tam says to them That looks good and one of the lads replies The food or us? To be fair, I think Tam would have taken either. Our next stop is Florence Falls. They are doing some work here, so you cant swim, but we walk to a lookout point where you get a good view. These are the most spectacular of the falls we see today. Back in the bus and we are on our way to our last stop of the day, Buley Rockpools. These are a series of small pools descending down the side of a hill. We have an hour here, so plenty of time for swimming. There are quite a few people here, as there has been at all of our stops. Tam and I walk up to the highest pool, which is quieter. The water is quite warm and its really nice sitting in the pool for a while. We walk down to the lowest pool and I go in as Tam dangles her toes in the water as some of the pools are fairly deep (one brave soul is diving in off the rocks) and difficult to get in. 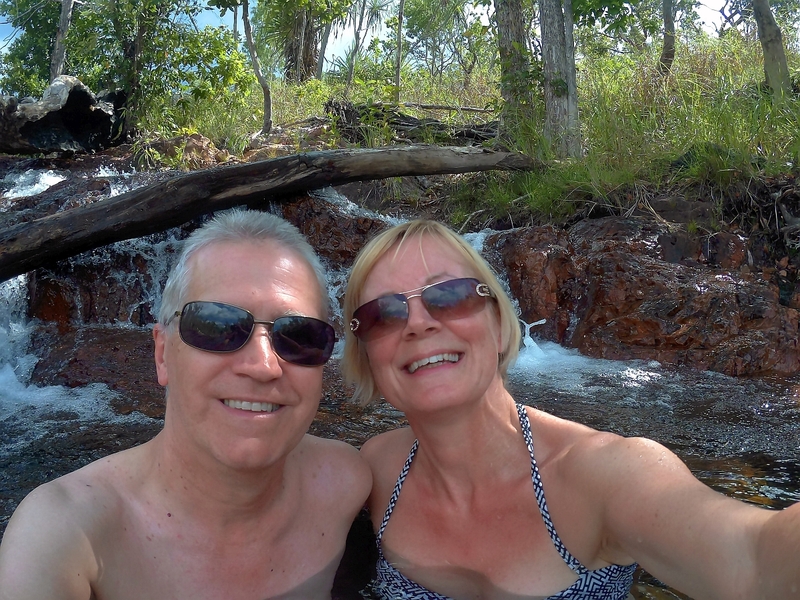 I sit underneath the cascading water with a nice chap from Scotland, who is also on our tour and we talk about our day out and the cruise in general. Its soon time to leave, so we dry off and walk back to the bus. It takes about 2 hours to get back to the port, arriving at 6.00pm. Barney has been really good, so we tip him $20 (AUS). Its surprising how few people tip on these trips, in fact the only other person we see do it is the Scottish gentleman. Thats broken a few stereotypes. To be fair, there are a number of people behind us on the bus, so they might as well. Back on the ship we go straight to the Sunset Bar for the cocktail of the day, a Matador, which is a sort of sweet margarita. This is swiftly followed by a beer. As we are enjoying the evening sunshine, we decide to grab something from the Oceanview Café. The fresh fish looks wonderful, so we both have the barramundi. Its freshly grilled and really lovely. Back to the stateroom where we shower and then go to the World Class Bar for a margarita. Loida tells us the bourbon infused with figs is coming along nicely and will be ready for tomorrow. The Ensemble Lounge is next where I have a Negroni and Tam has a vodka and soda. Were actually feeling quite tired tonight, so we go to Café Al Bacio for a liqueur coffee each, along with a few of their small cakes. 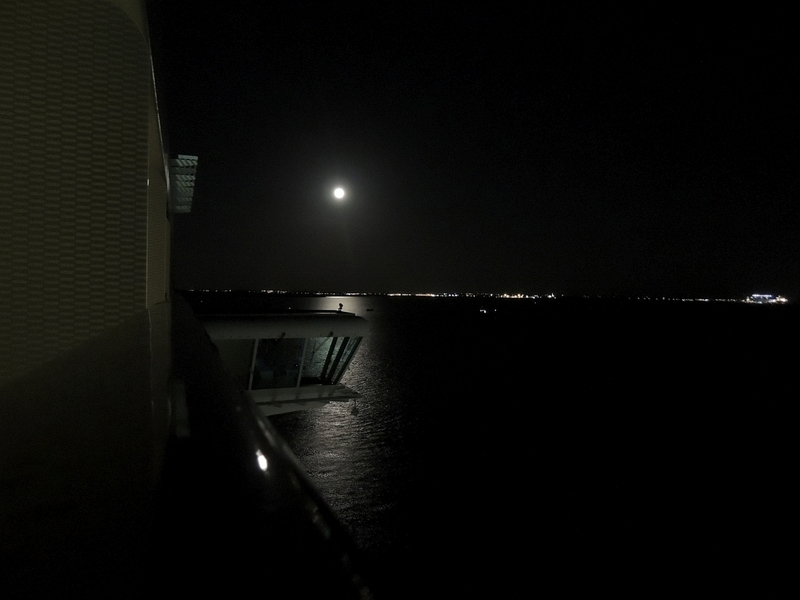 We are back in the stateroom and in bed at 11.00pm.